The Social Economy Sector and the Welfare State in France: Toward a Takeover of the Market? 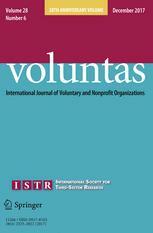 The Polish Social Enterprise Sector Vis-à-Vis the Welfare Regime: Following on the Solidarity Movement? Canadian Social Enterprises: Who Gets the Non-Earned Income? Social Impact Investments: Does an Alternative to the Anglo-Saxon Paradigm Exist?